In an act of hubris defying logic, the Morton County Sheriff’s Department now claims Sunday night’s vicious offensive against water protectors opposed to the Dakota Access Pipeline — during which two tribal elders suffered cardiac arrest, a rubber bullet struck a 13-year-old girl in the face, and a young woman carrying water to others had her arm nearly blown off — is the fault of the activists. Worse, the sheriff claims officers did not use a low-powered water cannon against the unarmed crowd of around 400 people — despite live footage from the scene so explicitly proving that, even corporate media called the assertion to task. Worse still, the sheriff balked at the accusation police used concussion grenades, and Sophia Wilansky — the water protector whose horrifically mangled arm might have be amputated — suffered that injury because she must have been incompetently rigging an improvised explosive. The sheer audacity required for this level of blame-dodging would almost be humorous if it weren’t for the appalling reality that people’s lives transformed dramatically and permanently Sunday night. Obviously, the sound of an explosion in the crowd would be the case — considering police indiscriminately launched countless canisters of tear gas and concussion grenades, which then exploded amongst the group of water protectors trapped on Backwater Bridge. To wit, Herr told the Times no one was arrested for either making or throwing explosives. Although no footage has yet emerged, if any exists, of the moment Wilansky’s arm was shredded down to the bone, the chances the sheriff’s explanation have any basis in truth are effectively nil. Witnesses on the scene said the young woman had been seen bringing water to the group under attack by police at the time the projectile struck her squarely in the arm — clearly not the act of someone preparing to throw an explosive device at officers. In fact, evidence has emerged the sheriff’s department’s claim is an outright lie. 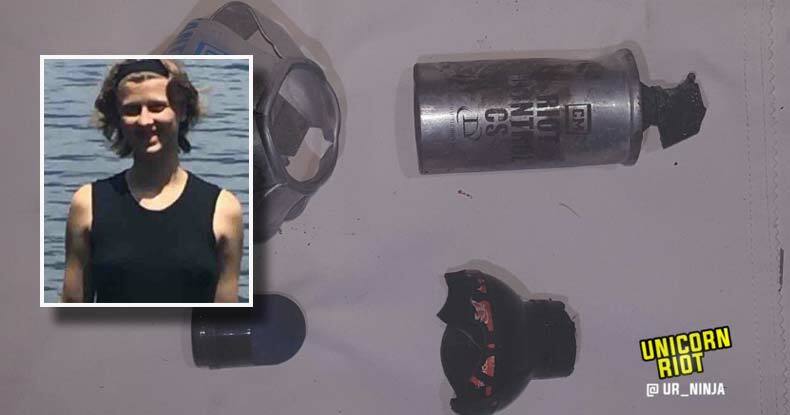 Unicorn Riot, which reported from the scene that night and is camping with Standing Rock Sioux and hundreds of other water protectors, returned to Backwater Bridge on Monday and, along with detonated tear gas canisters, discovered remnants of at least one Stinger grenade. Beyond Stinger grenades, tear gas, and rubber bullets, law enforcement deployed a low-intensity water cannon to the bridge on Sunday — though, depending on which Morton County Sheriff’s Department spokesperson you’re supposed to believe, either no such water cannon was deployed, or one was deployed, but only to extinguish several fires set by water protectors. First, it must be noted, water protectors did, indeed, set several fires as heat sources, with temperatures dipping as low as 23° — but those were controlled flames, not wildfires set as an offensive measure against authorities, as police claim. Second, video footage from multiple angles indisputably proves not only the presence of a law enforcement water cannon, but that water protectors were the intended target, and were doused immediately while fires burned next to the equipment. While water cannons soaked the activists in temperatures nearly guaranteed to induce hypothermia, the fire department arrived on scene to quench the flames — the sole source of heat for the embattled water protectors. E’sha Hoferer, who has livestreamed multiple incidents in which police have employed violent force against unarmed activists in the ongoing fight against the pipeline, told NBC News he had been hit with tear gas and cold water, and disputes the sheriff’s department claims about the fires. Even the Sheriff voiced concerns about water protectors suffering hypothermia in the bitter North Dakota winter weather — rather, he did so two days before soaking the group in water. Morton County Sheriff Kyle Kirchmeier has repeatedly asserted water protectors encamped in multiple locations have been aggressive against police; and while a few incidents — including the torching of military vehicles blocking the Highway 1806 bridge — have turned destructive, water protectors and independent journalists noted these were likely the work of provocateurs. Well-established rules at the Oceti Sakowin and other camps prohibit weapons and any acts of aggression, including violence against officers and others — violators are swiftly banished. When Herr cited “aggression from the agitators in the camp [who] continued to raise their level of resistance against law enforcement” as the motivation to deluge 400 people on a bridge with icy water in frigid conditions, the claim seems suspiciously hollow and lacks the burden of evidence. Police say one officer suffered a minor head injury from an object thrown by the crowd, but if that was the extent of aggression that led to an over six-hour assault with ostensibly less-than-lethal weapons, that response would be severely disproportionate, at best. But, as they say, to determine who wants to start a riot, look at who came prepared for one — and the Morton County Sheriff’s Department and officers from some 20 supporting departments from at least five states, have repeatedly arrived in full military gear with blast-resistant armored vehicles in their encounters with unarmed, prayerful water protectors. And each time violence ensues, it has thus far been initiated by police — and indiscriminately so. Sunday’s confrontation was no exception. Water protectors concerned the blockade of burned vehicles on Highway 1806 — in place since October 27, and reinforced with cement barriers and razor wire by police in the interim — constituted a safety threat and obstruction for first responders to access the Standing Rock Sioux reservation, camps, and local residences. On Sunday, after authorities dangerously refused to dismantle the blockade, water protectors with bulldozers attempted to clear the vehicles themselves — and came under fire by police shooting rubber bullets — sparking the hours-long contentious attack. Now, some 50 years after such images infuriated the world and fueled the efforts of the Civil Rights Movement, there is a confluence of historical contexts playing out in the movement to stop construction of the Dakota Access Pipeline. Taxpayer-funded State agents are attacking peaceful Native Americans with brute force — on the same lands European settlers committed genocide against them centuries ago — in order to ‘protect’ a Big Bank-funded Big Oil company’s pipeline project which threatens to contaminate the drinking water supplies of both the Standing Rock Sioux Reservation and around 18 million others along the Missouri River. And the tragic irony of using water — considered a living entity to Indigenous Americans — to fight peaceful people whose greatest wish is to stop the pipeline in order to protect the water has not been lost on anyone. Indeed, it would seem police chose to weaponize water as a cruel and twisted joke. Sophia Wilanksy, whose arm cannot be saved by a team of medical personnel at the Minnesota hospital where she was airlifted, was transporting water to the water protectors being assaulted with water when she suffered the traumatic and fateful explosion. A GoFundMe campaign to assist with her medical expenses has raised over $157,000 in just 11 hours, but it can never make up for the careless, vindictive police actions. Yet, police from North Dakota and those whom taxpayers funded to import from other states continue their attacks — continue to use tactics fit for an aggressive and belligerent enemy on a battlefield in war — amid a profoundly deafening silence from President Barack Obama, President-elect Donald Trump, nearly all of Congress, and, generally, those with the power to effectively halt the violence. Until they do speak up, put an authoritative foot down, admonish police barbarism, or affect anything substantive to address the concerns of Standing Rock Sioux water protectors and human rights advocates, the belligerence and lies will continue on a perilous course for disaster. One young woman might lose an arm because police chose to act with inexcusable force — whether or not the department ever takes rightful responsibility — two tribal elders nearly lost their lives from cardiac arrest, and scores have been mauled, battered, bloodied, and generally brutalized in the effort to preserve the most basic human need: clean water. Perhaps the politicians, the pipeline company, and, most of all, the police officers, should remember the whole world is watching avidly as centuries of exploitation and brutality repeat in real time.